kinda sick today. but it was so nice out! so of course, i used the occasion to hop on the roof. wearing: new sandals! 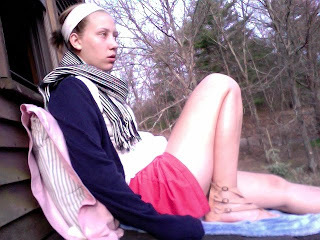 $10 from urban outfitters, scarf- burlington coat factory, cardigan- american eagle, shorts- $3 thrifted, v neck- sister's.